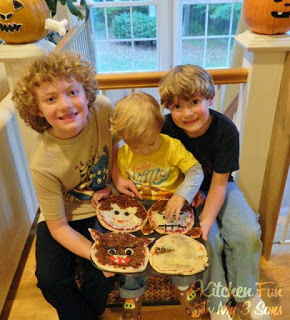 We made these Classic Monster Pita Pizzas the other night and my boys loved them! 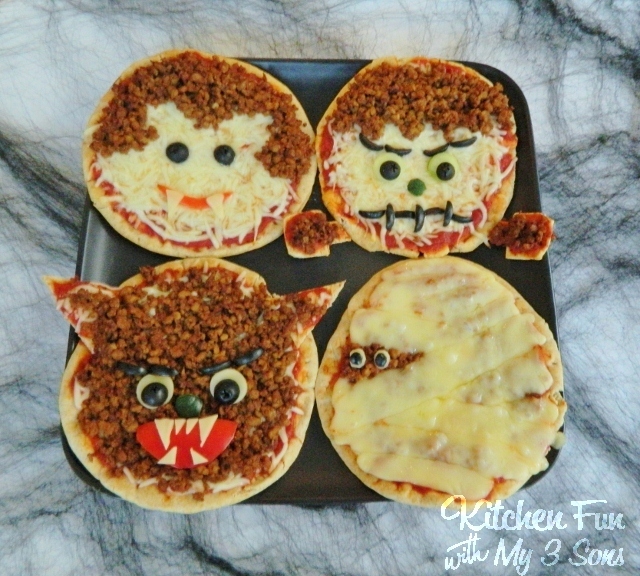 Kids will have fun decorating their own personal Halloween monster pizzas themselves! These are also a great way to get the kids to eat veggie soy crumbles (you could also use sausage or ground beef/turkey). Start out by spreading pizza sauce on the pita bread. Top with shredded cheese expect for the mummy. We added the veggie crumbles on that first and then the cheese. We used 1 extra pita bread to cut out the Wolfman’s ears and Frankenstein’s electrodes. Decorate with the crumbles and veggies. Back at 350 for 10 – 15 minutes until cheese is melted. 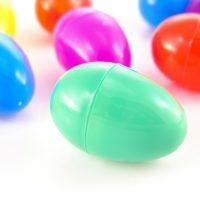 Thanks for sharing 'em at our linky party! Fun! Those are so cute! I saw you on Tater Tots and Jello…we're going to try to make the mummy ones tomorrow! Great designs! 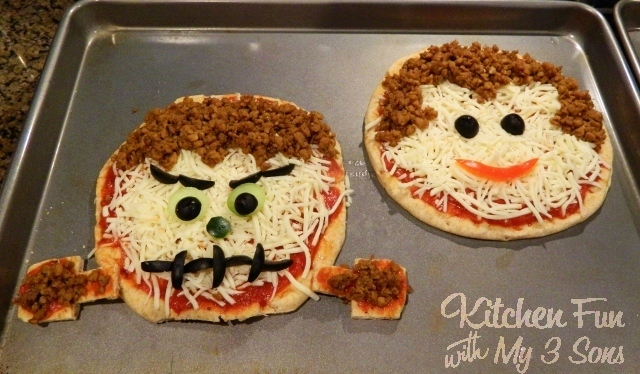 What a fun meal to serve for Halloween. They are all so interesting! 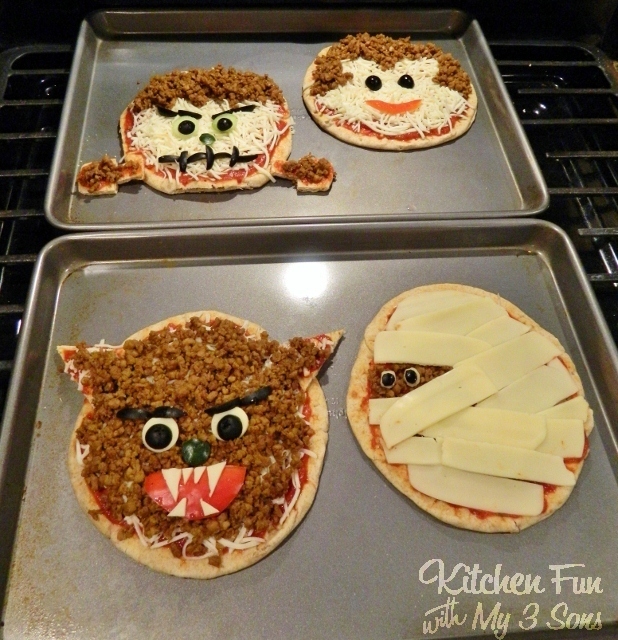 I especially love the wolf man pizza. You sure are the most creative food blogger!!! 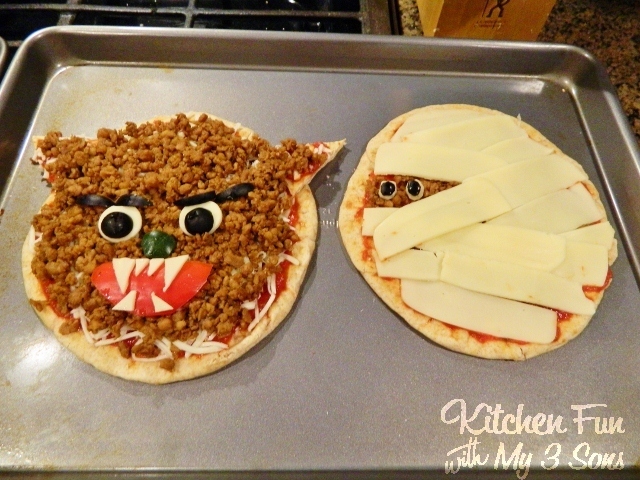 MONSTER PIZZA???!!!! 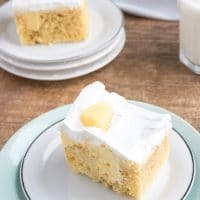 We are so having these tonight!!! LOVE these. You are so creative!! SUCH a fun idea! Really clever. These are so sThanks for linking up to our Strut Your Stuff Saturday! We hope you'll be back soon! -The Six Sisterstinkin cute!! 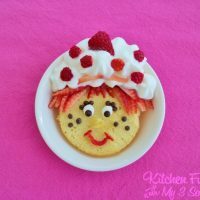 We love this fun idea/recipe!